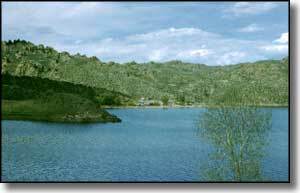 Curt Gowdy offers two good campgrounds, each with a few reservable campsites. The Tumbleweed Campground has a free public horse corral next to it for those who bring their horses for the vacation, too. There are also many miles of hiking, mountain biking and horseback trails to explore in the park and in the nearby Medicine Bow National Forest. Another feature of Curt Gowdy State Park is the Hynds Lodge, a building listed on the National Register of Historic Places. The Lodge is open for use by large and small groups on a reservation basis from May 1 to October 1 of each year. In the Lodge are a large kitchen, dining area, recreational and sleeping accommodations and a large covered porch. Call the Park office for reservations and more info. Also in the Park is an amphitheater often used for theater productions, music concerts and other cultural activities. 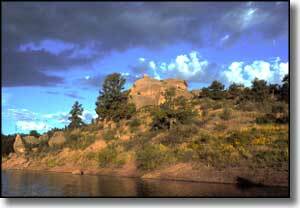 Curt Gowdy State Park can be reached via State Route 210 (Happy Jack Road) between Cheyenne and Laramie, north of the I-80.